It's that time of year again, you're likely thinking where did the summer go? We have a number of story ideas for you that are sure to be of interest to viewers, listeners and readers as parents and students prepare for another exciting school year. Dr. Ji Lu, a researcher within Dal’s department of business and social sciences, studies why people purchase the food they do and why they consume certain foods. As he tries to get inside the minds of consumers, Dr. Lu’s research looks at consumer behavior and data, providing insight into why people often experience weight gain during transitional phases of their lives. Better Nights, Better Days (BNBD) is an evidence-based online intervention program for parents who have children that experience sleep issues. Dr. Penny Corkum and her partners across Canada will start delivering the program to Canadian families on Sept. 6th. This program aims to help families nix poor sleep habits, leading to an improved quality of life for their kids around the clock – better behaviour, better mood, and better school performance. 1 in 4 Canadian children will experience ongoing struggles with sleep problems categorized as insomnia. There is evidence to support the efficacy of behavioural treatments for insomnia, and there is a critical need for access to these interventions. Dr. Penny Corkum, registered psychologist and professor of clinical phycology at Dalhousie, can discuss how these treatments work and why there should be a readily available solution for families. Back to school marketing campaigns are in full swing, in fact they have been since mid-July, but do students really need the latest technology, supplies and clothing that are being heavily advertised to excel inside and outside of the classroom? Dan Shaw, Director of Dalhousie’s Corporate Residency MBA program, can discuss the marketing techniques used by companies to convince parents and students that they must have the latest back to school gadgets and styles. The beginning of the school year comes with many responsibilities for students including setting up new online accounts, mobile devices, online banking and email. Amidst the flurry of responsibilities that come with heading back to school, are are students always thinking about the threat of online hackers? Dr. Srinivas Sampalli, a cyber security expert who specializes in security and privacy in wireless technologies, provides insight on some of the latest cyber threats and the ways hackers can attack devices and networks, and discusses some do's and don'ts of setting up your new accounts, use of social media and mobile devices. As students become more immersed in the world of social media, bullying is not only happening on the playground or in the classroom, but online as well. Drawing from his experience as former chairperson of the Nova Scotia Task Force on Bullying and Cyberbullying, Dr. Wayne MacKay can provide insight into cyberbullying, what it is, who it impacts, what parents should do if they suspect their child is engaging in or is the victim of cyberbullying and what victims should do if they are being bullied online. This year the Federal government welcomed 26,000 refugees to Canada, 48% of who were under the age of 15. Many of these children spent time in refugee camps resulting in a disruption to their education. Dr. Michael Ungar, Canada Research Chair in Child, Family and Community Resilience and Professor of Social Work at Dalhousie University, is currently researching obstacles experienced by refugee children including mastering a new language and education system, racial discrimination and bullying. Dr. Ungar can comment on how he and his colleagues across the country are looking at how with the right intervention refugee children can flourish and excel both academically and socially within their new environment. 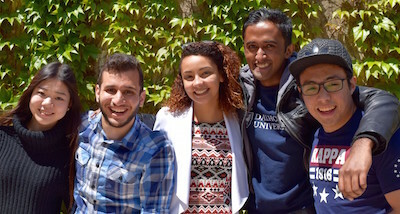 Each year Dalhousie welcomes students from around the world. As part of the International Centre’s Global Connections Welcome Ambassador program, during the summer months student Welcome Ambassadors host a series of webinars where they provide answers in various languages to incoming students about visa and permit matters, academic support, student life and more; all in a unique and friendly environment. Welcome ambassadors also offer one on one peer support to incoming international students. Welcome Ambassador, Hasan Sinan a third year psychology student from Kuwait, can provide perspective on his experience coming to Nova Scotia to study and on what our Welcome Ambassadors do to make new students feel prepared before they arrive in Halifax. As a young adult it can be difficult to know how to save and pay for university. Dr. Jun Zhou, a Chartered Financial Analyst® and Associate Professor in Dalhousie’s Rowe School of Business, can provide financial tips that parents and high school students can utilize while saving for university. Dr. Zhou can also provide budgeting advice to university students who are balancing their education and living expenses. Whether they are new to university or returning students, students can benefit from working with a career counselor that will assist them in their decision making process when determining their educational and career paths. Anna Cranston, Director of Management Career Services, can provide advice to help students identify their future aspirations and align their academic and career choices to ensure they reach their goals. Although an exciting time in a student’s life, the transition from high school to university can also be overwhelming. Anne Forrestall, Dalhousie’s Senior Assistant Vice-Provost, Student Affairs, can provide perspective into the challenges students often experience during this time and the services available at Dalhousie to assist with their successful transition. We don’t always notice all the living things around us, especially in our urban environments. But life outdoors on campus, even in the heart of Halifax, is abundant. Departments in Dalhousie’s Faculty of Science are coming together to host the first ever “BioBlitz”: a rapid survey of organisms in a given area. Students, faculty and staff will be exploring campus all day, observing and recording all signs of life they find along the way. Media are invited to join any one of the working groups led by a Dal expert who will help identify the species as they’re sighted. Observations from the BioBlitz are recorded and tracked using the iNaturalist platform and eventually used in curriculum for relevant biology and environmental science classes. The data, once verified in several ways, may even be used in scientific research down the road. The initiative aims to engage the Dal community (and its neighbours) in citizen science projects that encourage physical activity, curiosity and exploration. On Saturday, September 10, Dalhousie students are hitting the streets to volunteer with local community organizations. 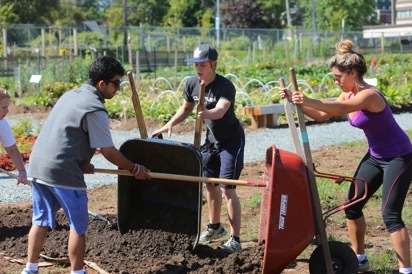 For the past nine years Dalhousie has been partnering with local non-profits to provide a sense of community involvement amongst Dalhousie students. It also provides incoming students a chance to get to know the community they will now call home. This year’s event includes partnerships with YWCA, Common Roots Urban Farm, and Mothers Against Drunk Driving (MADD) and more.